Preheat oven to 350F. Lightly grease two 9-in round cake pans. Set aside. Place sugar, butter, and cinnamon in a medium saucepan. Bring to a boil over medium-high heat, stirring occasionally until caramel is golden-brown and slightly thickened. Remove from heat and divide between bottom of prepared pans. 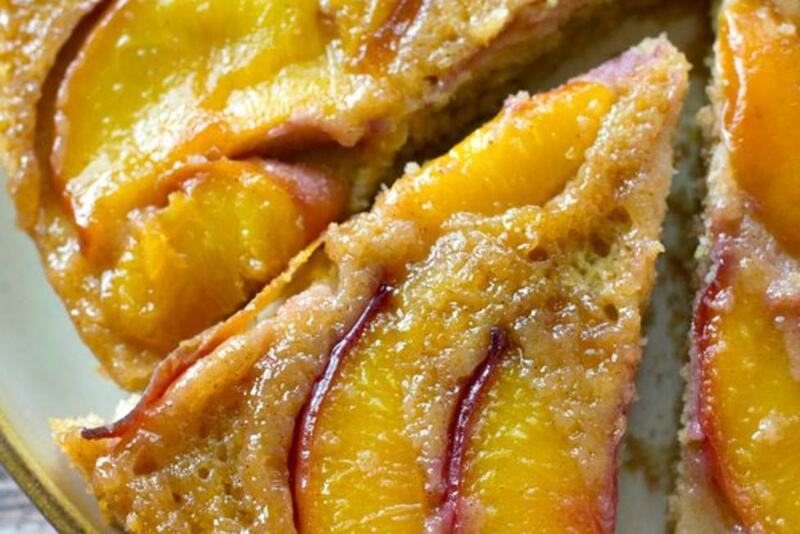 Arrange peach slices over top and set aside. Make the cake: In a medium bowl, whisk flour, baking powder, salt, and cinnamon. In a separate medium bowl, beat butter and sugar until creamy. Beat in yogurt, eggs, milk, and vanilla until smooth. Fold flour mixture into liquid until just combined. Divide batter between pans, gently spreading over peaches. Bake coffee cakes at 350F 25-30 minutes or until cake springs back when lightly touched. Cool coffee cakes on a wire cooling rack 10 minutes, then invert each cake onto a serving plate. Cut into wedges and serve warm.